Eye problems are among the most significant complications of diabetes, which is the most common cause of blindness in people of working age. Diabetes affects the eye in a number of ways. The most damaging condition occurs when the fine network of blood vessels in the retina – the light-sensitive inner lining of the back of the eye – leak fluid. This is known as diabetic retinopathy. Cataracts also develop earlier and progress more rapidly in people with diabetes than in other people. Untreated diabetes may also make cause frequent or noticeable changes to your eyesight. Serious eye problems are less likely if the diabetes is well controlled or in its early stages. Most sight loss from diabetic eye disease can be prevented if detected early and treated. How can your optometrist help? Optometrists have an important role to play in detecting the disease and in monitoring the eyes of people with diabetes once diagnosed. Checking the appearance of the retina with an ophthalmoscope, a special torch for looking into the eyes, is the most commonly used test for diabetic eye problems. Photographs of the retina may also be used to detect and monitor any abnormalities. If diabetes is suspected, your optometrist will refer you to a GP or hospital for medical advice. If diabetes is diagnosed, your eyes will need to be examined regularly for signs of eye problems. You may be referred to a hospital eye clinic or be referred back to your optometrist for regular monitoring (known as Diabetic Retinopathy Screening or DRS). Even though your vision may be good, changes can be taking place to your retina that need treatment. 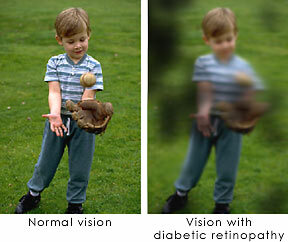 Remember, however, that if your vision is getting worse, this does not necessarily mean you have diabetic retinopathy. It may simply be a problem that can be corrected with spectacles. Most sight-threatening diabetic problems can be prevented by laser treatment if it is carried out early enough. It is important to realise, however, that laser treatment aims to save the sight you have – not to make it better. The laser, a beam of high intensity light, can be focused with extreme precision to seal the blood vessels that are leaking fluid into the retina. If new blood vessels grow, more extensive laser treatment may be needed.